World House Gallery, New York; Mr. and Mrs. Walter Salant. Art for the Nation: Gifts in Honor of the 50th Anniversary of the National Gallery of Art, National Gallery of Art, Washington, D.C., 1991, 360-361, color repro. 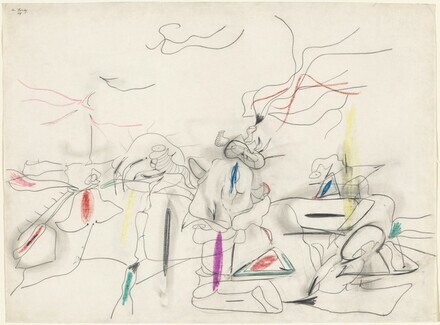 Arshile Gorky: The Breakthrough Years, National Gallery of Art, Washington, D.C.; Albright-Knox Art Gallery, Buffalo; Modern Art Museum of Fort Worth, 1995-1996, no. 35, repro. (shown only in Washington and Buffalo). A Century of Drawing, National Gallery of Art, Washington, 2001-2002, no. 74. Art for the Nation: Gifts in Honor of the 50th Anniversary of the National Gallery of Art. Exh. cat. National Gallery of Art, Washington, 1991: p.360. Arshile Gorky: The Breakthrough Years. Exh. cat. National Gallery of Art, Washington; Albright-Knox Art Gallery, Buffalo; Modern Art Museum of Fort Worth, 1995-1996: no. 35. A Century of Drawing. Exh. cat. National Gallery of Art, Washington, 2001-2002: no. 74.